When a user runs a report, Geocortex Reporting gets the data from the data source and then populates the report with the data according to the author's design. There are several steps to use a data source in a report. You must first configure the data source's connection information. Geocortex Reporting uses the connection information to connect to the data source when the user runs the report. Next, you must add the data source to the report. This makes the data source available to the report. Finally, you must add data fields to the report's layout. This includes the data in the generated report. These are the minimal steps to include data in a report. In a production report, you will also want to format the report's content, add headers and footers, and so on. In the tutorial below, you will use a public ArcGIS Online map service as the data source. To help you get you started designing and running reports quickly, the tutorial uses the Layer Report wizard to create the report. The Layer Report wizard creates a layer report—a report that presents ArcGIS feature data for the features that are currently selected by the user. The Layer Report wizard simplifies report creation by performing some of the steps for you. The wizard creates the data source, adds the data source to the report, and configures the report to restrict the data to the user's currently selected features. In some reports, you will want to do these steps yourself. Tutorial - Create a Layer Report Using the Blank Report Template shows how to do each step in detail. In this tutorial, you will create and preview a report that presents feature attributes from an ArcGIS map layer of US states. The report will present three attributes for each state: the state name, the region, and the Federal Information Processing Standards (FIPS ) code. When you preview the report, the Preview function will prompt you to enter the feature IDs (object IDs) of one or more states. These are the states that will be included in the report. In a production environment, the end user is not prompted to enter feature IDs. Instead, the report uses the current selection set. This reflects the typical pattern of how reports are used in a web mapping environment: the user selects some features on the map or in search results and then runs the report on those features. Geocortex Reporting can run in two environments—in the cloud or on premises. To do this tutorial, you must have an ArcGIS identity that gives you access to one of these environments. Cloud: To do this tutorial in the cloud environment, you need an ArcGIS Online account. You can use a public account or an organizational account. You can get a public account here for free. On Premises: On-premises Geocortex Reporting is registered either with Portal for ArcGIS or with ArcGIS Online. The registration information is on the Geocortex Reporting Post Installer's Portal tab. Portal for ArcGIS: If Geocortex Reporting is registered with your organization's on-premises installation of Portal for ArcGIS, do this tutorial using the account that you use to access your organization's portal. The tutorial uses a public ArcGIS Online map service. If your organization's portal does not have access to the Internet, you will have to substitute a map service that you have access to. ArcGIS Online: If Geocortex Reporting is registered with ArcGIS Online, do this tutorial using your ArcGIS Online account. Create a new report using the Layer Report wizard. Add data to the report. Launch Geocortex Report Designer and click Let's get started. Sign in if you are prompted. If you are using Geocortex Reporting in the cloud, you can access Report Designer here. Select Use a new ArcGIS layer or table, and then click Next. This option configures a new data source. The Layer Report wizard connects to the map service and displays the layers in the map service. A new layer report opens in Report Designer. The report has the data source that you specified ( ), a table of feature attributes from the layer that you selected ( ), a title in the top margin ( ), and a data field for a feature's OBJECTID ( ) in the data area (detail band). The report also has a query filter that is not visible in the screen capture. The query filter restricts the features that are included in the report to the user's current selection set. In this step, you will specify which data fields to include in the report, where in the report to present the data, and how to format it. You will add the data to the Detail1 band. Detail bands like Detail1 are used to show data from a data source and other report details. Click Fields to open the Field List. 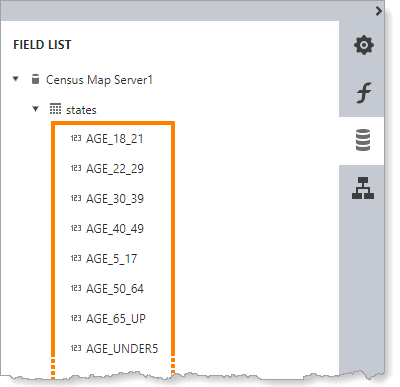 Expand Census Map Server1 to show the states table, and then click states to show the fields. The Layer Report wizard configures the query to return all the attributes in the layer. You can modify the query to only return the attributes that you want to use in the report. Drag STATE_NAME from the Field List and drop it to the right of the OBJECTID field. Drag STATE_FIPS from the Field List and drop it to the right of the STATE_NAME field. Drag SUB_REGION from the Field List and drop it to the right of the STATE_FIPS field. To format a data field, select the field on the design surface and use the Properties panel to define the formatting. Click the SUB_REGION control on the design surface to select it. Drag the center right handle towards the right to make the control wider. Drag the bottom edge of the Detail1 band toward the TopMargin1 band to reduce the size of the Detail1 band. This decreases the amount of vertical space between data items in the generated report. The Layer Report wizard adds a title to the TopMargin1 band. Adding the title to a margin band repeats the title on every page. In a production report, you might want to add a report header band to the report and put the title there. The content in the report header band appears once at the very beginning of the report. Click the Title control on the design surface to select it. Click Properties to open the Properties panel. The Properties panel shows the properties for the Title control. Alternatively, you can double-click the title control on the design surface and edit the title in place. I n the Properties panel, expand Appearance | Font. Configure the title to use bold, 15-point Tahoma text. Press Ctrl+S or click File | Save As. Click away from the File panel to close the panel. The Preview function allows you to run the report from within Report Designer. This provides a quick way to test your reports while you are designing them. To preview a report, your browser must allow pop-ups from apps.geocortex.com (cloud Reporting) or from your domain (on-premises Reporting). You are prompted to enter one or more feature IDs. To enter a feature ID, type the ID and then press Tab or Enter. Geocortex Reporting generates the report and opens it in a new browser tab. Now that you can see the report's output, you may want to return to Report Designer and modify the report's formatting or content. As a report author, you will typically create a first draft of the report, preview it, make some improvements, preview it again, and so on, until you are satisfied with the result. You would then configure an application to host the report and test it in the host environment. Finally, you would share the report with the end users so they can run the report from the host application.